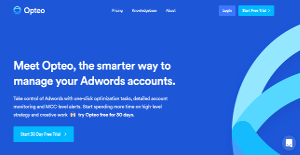 Opteo is an AdWords management platform that automates and streamlines management-related tasks for your AdWords accounts via one-click improvements, detailed account monitoring, and MCC-level alerts. The system analyzes trends and figures to identify significant and relevant patterns in your AdWords accounts. From there, it automatically builds workflows that optimize your accounts’ performance. Linking Opteo to your AdWords MCC (My Client Center) treats you to a robust set of features and premium tools like improvement engine, budget tracking, monitoring, MCC-level alerts, and more. With Opteo, you are able to optimize your AdWords accounts, track and resolve issues, and automate AdWords processes that take so much of your time, enabling you to do more and accomplish more. Opteo implements a proprietary algorithm that scours your AdWords accounts to find inefficiencies and automatically builds workflows that optimize major performance areas of your accounts. These workflows can then be activated with just a single click of a button. The system offers more than 20 improvement types, including pause underperforming ads, adjust keyword bids, optimize campaign bids, fix broken links, optimize campaign search queries, and pause duplicate keywords to name a few. Opteo’s proprietary algorithm is constantly improved, which means the optimization tasks it recommends are always based on best practices and offered depending on its importance. These processes are always double-checked and shown in Opteo’s Improvement Box. All you have to do is decide whether to launch or dismiss each task. With Opteo, all key metrics are located in a single location, making it convenient for users to view and access information whenever they need to, like when they had to monitor and resolve account performance issues quickly. On top of that, users can add more metrics that are not offered in AdWords, such as Quality Score Components, AdRank, and more. Opteo has an alert system that you can configure so that it automatically send you alerts for specific scenarios, like when important changes are happening in certain accounts. And because alerts are shown globally, you are always aware of what’s happening and react instantly and intelligently. Every business is different, and might need a special Marketing Software solution that will be fit for their business size, type of customers and staff and even specific industry they cater to. It's not wise to count on finding a perfect software that is going to be suitable for each business regardless of their history is. It may be a good idea to read a few Opteo reviews first and even then you should pay attention to what the service is intended to do for your business and your employees. Do you require an easy and straightforward service with just essential functions? Will you really make use of the advanced tools needed by pros and large enterprises? Are there any specific tools that are especially practical for the industry you work in? If you ask yourself these questions it is going to be much easier to find a solid service that will match your budget. How Much Does Opteo Cost? We realize that when you make a decision to buy Search Marketing Software it’s important not only to see how experts evaluate it in their reviews, but also to find out if the real people and companies that buy it are actually satisfied with the product. That’s why we’ve created our behavior-based Customer Satisfaction Algorithm™ that gathers customer reviews, comments and Opteo reviews across a wide range of social media sites. The data is then presented in an easy to digest form showing how many people had positive and negative experience with Opteo. With that information at hand you should be equipped to make an informed buying decision that you won’t regret. What are Opteo pricing details? What integrations are available for Opteo? If you need more information about Opteo or you simply have a question let us know what you need and we’ll forward your request directly to the vendor.